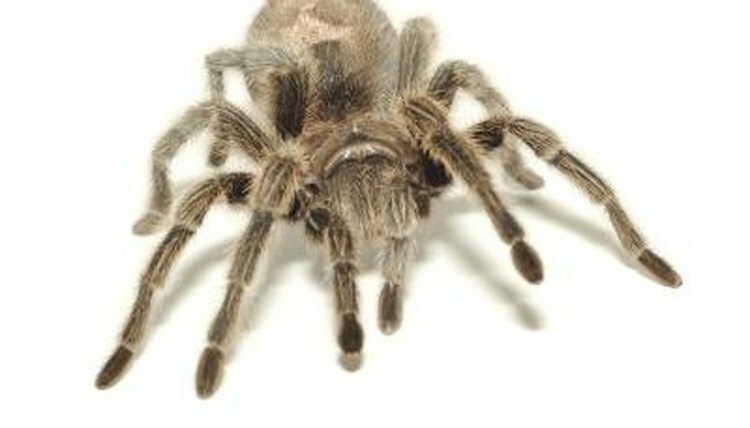 You might be surprised to find out that some people keep tarantulas as pets. Payson blonde tarantulas, also known as Arizona blonde tarantulas, are mild-mannered spiders who rarely are threatening to humans, despite the large size and fuzz that makes them look menacing. Like any wildlife they should be respected, but Payson blonde tarantulas shouldn't be feared. A full-grown Payson blonde tarantula can reach up to 5 inches in length with proper feeding and care, though the average size of an adult in captivity is between 2 1/2 and 4 inches long. Most of the growth comes in the first five years of life. Covered with tan or light brown fuzz, this stocky spider has eight legs, an abdomen and a cephalothorax, and two pedipalps that it uses like hands to pick up or move prey. Tarantulas can see, but they perceive their surroundings mainly through the vibrations of tiny hairs, called setae, that are all over their bodies. They also are sensitive to pheromones and chemical changes within their environment. If you plan to keep a Payson blonde tarantula as a pet, consider this fuzzy arachnid's longevity. Males can survive up to 12 years -- a lengthy commitment for prospective pet owners. A female Payson blonde might live as long as 24 years and will need your daily care and feeding throughout her lifetime. Native to the deserts and shrublands of Arizona, the Payson blonde thrives best in hot, dry climates. When keeping a Payson blonde at home, maintain an enclosure temperature of 70 to 80 degrees, with a humidity level of approximately 65 percent and a clean, dry substrate for underground burrowing. A Payson blonde tarantula thrives on a diet of small insects, including beetles, grasshoppers, and flies; they also eat lizards and even small spiders. Like most living creatures, it requires fresh water to drink daily. Because its mouth is shaped like a tiny straw, the Payson blonde must liquefy its food before digesting it. It does this by coating its prey with digestive juices secreted from openings in the chelicerae just above its mouth. Pompilidae wasps and giant centipedes kill and feed on Payson blondes and other tarantulas, given the opportunity. As protection against these and other threats, tarantulas sometimes use their back legs to "kick" urticating (irritating) hairs into the air. These tiny, barbed belly hairs can kill small animals, and in humans they can cause tremendous eye, nose, throat, or respiratory . Although a bite by a Payson blonde isn't normally fatal to humans, it can cause moderate to severe discomfort, and the site of the bite might itch and swell. Some people have an allergic reaction to the venomous proteins injected at the bite site. Depending on the severity of the allergy, this reaction could be fatal. How Do Black Widow Spiders Catch Their Prey?